A view from the Tower at Ocean Beach. Photo by Annie Lane. Editor: We found an important debate going on in the pages of the Point Loma Democratic Club, and decided to repost the following positions. The first is by Michael Russell, a former San Diego lifeguard, who raises serious questions about gender, diversity, salaries and politics of the lifeguard union, Teamsters Local 911. The second is a response by Ed Harris, union steward for Teamsters 911 (quotes in italics are from Russell’s piece). Thank you for inviting me to your monthly meeting to listen to Ed Harris present his case for your support. As a former San Diego Lifeguard, I was interested in hearing his plea to Democrats for help in swaying the San Diego City Council. 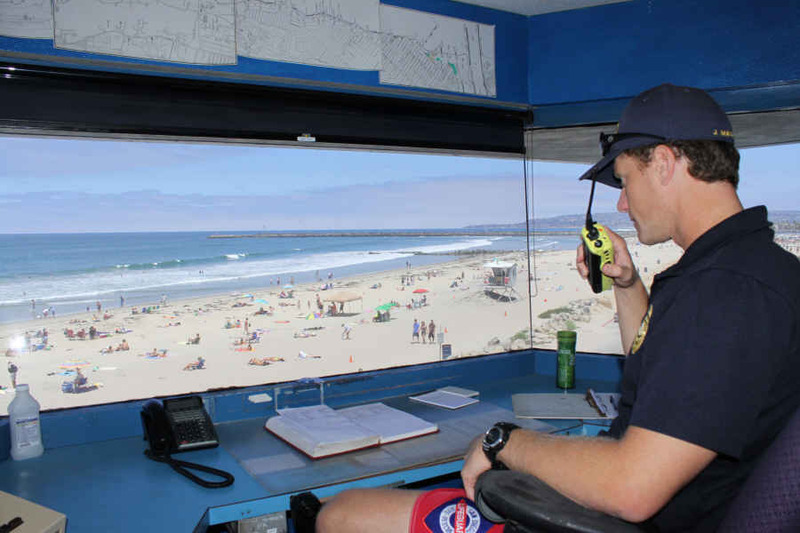 His quest as Union Steward for Teamsters 911 is to build and replace three Lifeguard Towers in Ocean Beach, South Mission Beach, and North Pacific Beach. I agree that these City infrastructure projects are probably ripe, because of the low cost of current construction in this economic recession. Having worked at all these towers in the past, I agree that they are out of date and require constant upgrades, for such beach safety stations are necessary and appropriate. They are all major projects, costing millions, and must take into account long-term issues like sea level rise and changing beach demographics. I worked with Ed Harris as a lifeguard from 2000-2009, and know the lifeguard management well. However, after watching Harris squirm and wiggle, and try to contort and reinvent himself at the Club meeting on February 24, 2013, just to gain Democratic support, I think your members should know some more about the San Diego Lifeguard service and it’s history. You should know that the San Diego Lifeguards have traditionally supported Republican and independent (Libertarian) politicians. In his leadership roll for Teamsters 911, Ed Harris publicly supported Nathan Fletcher for Mayor. The Lifeguard split with the Municipal Employees Association (MEA) was likely a result of such political forces. Regardless of their individual political bias, the Lifeguards are primarily self-interested, and Ed is fighting for their share of the City pie, else other City departments scoop it up. This year the Lifeguard budget increased by $2.4-million (15% over 2012). They are some of the highest paid Lifeguards on the planet. Yet their ranks contain barriers to women and minorities, often resulting in costly court cases. Once you see the real salaries and benefits costs, you’ll understand why these Lifeguard Jobs are so highly prized. If the City were more transparent, it would publish all such compensation numbers for public service positions, but would probably put the voters into shock. I’ve included information sheets to give you some ideas about the facts, and remind you about various issues within the Lifeguard Service. The sources are public documents and reports. I hope you will read these documents, so that you have all the facts necessary when considering how to make up your mind about supporting our Lifeguard Services in San Diego. My point is simply this, although I naturally support lifeguards goals of public safety, the money for infrastructure improvements should not come from our City’s General Funds, especially in these times of critical financial stress. All money for tourist infrastructure, such as new beach stations, should be generated by coastal business interests. As you will see, there is also plenty of money in the Lifeguard’s $17-million dollar per year budget for all necessary improvements. If they would only reduce their maximum lifeguard compensation to just 150% the Average Household Income of the citizens they serve, all these improvements could be funded along with the critical outreach necessary to educate San Diego’s youth and build a more diverse workforce. But these Lifeguard Teamsters will not sacrifice their pay for public safety. As a former lifeguard, it is my firm belief that every child that grows up in San Diego has a right to be safe in the ocean, to learn to swim, and to understand and enjoy the unparalleled environments along our coast. These resources are our shared heritage, and should not be limited to the elite, wealthy community, that can afford to live along the shore. Unfortunately, a quick review of our annual lifeguard service photos will reveal a bleached beach tribe that rarely resembles the diverse demographics of San Diego. Excerpt from report on gender and racial discrimination among lifeguards. The attached documents show that the Lifeguard Service is historically a classic ‘old boys network’ and lacks the diversity and inclusiveness necessary in a large urban population, such as San Diego. These are the best paid Lifeguards on the planet, with many costing the city >$100,000/year (see Lifeguard salaries 2013). Yet, they keep these highly privileged jobs sequestered in a closed community, above a “glass celling”, an invisible barrier within the ranks, and most San Diego Citizens will never have the opportunity to participate or compete for these high paying jobs in public safety. Women make up less than 10% of the full-time lifeguards. Traditionally under-represented groups are almost non existent. Our children are often not trained in basic beach safety skills because they lack the wealth and resources necessary to access our beach areas, for even our public swimming pools are closed due to budget cuts. This is unacceptable, the ocean belongs to all of us. Given the current and ongoing history of gender and minority discrimination within the San Diego Lifeguard Service, and their failure to diversify Lifeguard management, before Democrats sign up as support, we should make sure that all possible measures are taken to correct these historical injustices. Lifeguard attempts to become more inclusive of our local population have always trailed the demographics. Their outreach has been quite limited, and training programs such as Junior Lifeguard are generally reserved to those wealthy patrons grandfathered into the beach community. Further, since the budget cuts took effect in 2009, City Lifeguards have cut all “Outreach Services” from programs such as operation “Waterproof San Diego” to protect their employee salaries. These programs were good and should be fully restored and funded before we start spending additional money from the general fund on non-critical improvements such as new stations. Due to your hard work and success, Democrats have a very short window of just a few years to demonstrate good government for the City of San Diego. If we miss this historic opportunity to deal with these issues of elitism, and they are not corrected, then our opponents will use things like high Lifeguard salaries as evidence of our unwise union largess, while calling attention to the deteriorating City infrastructure and services. The unfair distribution of resources and opportunities across the City is a historical remnant of the corruption caused by land developers, Point Loma Democrats know this well, but we can now begin to correct the injustice. Fear of tax increases could potentially reverse the close election results, and win back a majority of San Diego’s Council seats for those who would continue to stratify our society. This would doom the next generation of Lifeguards to the same old patterns. We can break the glass-celing for women in our safety services, end the covert rejection of minorities, and correct the imbalances in opportunities between rich and poor. My hope is that by using your political influence, Democrats can finally discard the old boys systems, and open our beaches to everyone. Thanks for your article and numerous questions. I will attempt to address the issues you’ve raised. First of all, I agree with many of them and that is why we are now Teamsters. I will correct a few incorrect statements along the way. You seem to confuse management with the union. Management in the City of San Diego means that they work for the Mayor and are not represented by a union; they also do not have Civil Service rights. The Lifeguard Chief is the only “Managerial” position within the Lifeguard service. We have four lieutenants that are represented by the union, but unfortunately their views are often closer to management. Lifeguard sergeants are first level field supervisors. Sergeants are represented by the union and are definitely not management. It is important to point out that you and I did not work together for nine years. You were not a permanent lifeguard; you worked seasonally 3-5 months per year. Your job duties were limited to summer water rescues and not the wider range of duties performed by full time Lifeguards. I supervised you for a short period over those nine seasons, and that is the only time we worked together. In regards to facilities, I think your comments support our need for new towers. I disagree with your belief that the local businesses should be assessed to pay for the towers. Beach area businesses and residents pay taxes. The beaches are used by all, so services should be paid for by all. We want to see more of the tax money generated at the beach come back to the beach and district 2 neighborhoods. We do not want the lion’s share of beach area tax dollars going downtown. However, after watching Harris squirm and wiggle, and try to contort and reinvent himself at the Club meeting on February 24, 2013, just to gain Democratic support. There are few things that make me “squirm.” I think I was pretty clear. I was a Reagan era Marine. I am fiscally conservative. I did not re-invent myself for the meeting. My views have been shaped by twenty-three years of City service and by witnessing corruption and incompetence. My views have been shaped by responding to real tragedy and also by having children. Tragedy makes me squirm. Trying to blow life into a five year old body makes me squirm. You should know that the San Diego Lifeguards have traditionally supported Republican and independent (Libertarian) politicians. In his leadership roll for Teamsters 911, Ed Harris publicly supported Nathan Fletcher for Mayor. The Lifeguards, or more accurately, the Lifeguard Association and I personally supported Nathan Fletcher for Mayor. I stand by that decision for many reasons. One obvious reason was that he was the only candidate to ask. Nathan Fletcher sought us out, jumped off the pier and rode in our boats. He took the time to learn every aspect of what we do. He had a history of getting things done by reaching across the aisle. None of the other candidates even picked up the phone to call us. They did not ask for our endorsement or seek to learn what we do. Nathan did, and that went a long way with us. Nathan Fletcher’s endorsement was the first in twenty years. Maureen O’Conner was the last mayoral candidate supported by the Lifeguard Association. The Lifeguard Association was politically dormant for years. Since joining Teamsters in 2009, we got back into politics and have endorsed the following City Council candidates: Marti Emerald, Todd Gloria, Matt Kostrinsky, Sheri Lightner and now Myrtle Cole. All Democrats. I have never registered as a Republican; I have never been a member of the Republican Party. I am not sure how this is “traditional” nor do I recall us backing a Libertarian. The Lifeguard split with the Municipal Employees Association (MEA) was likely a result of such political forces. The MEA is not a union. They are a corporation. Because they are not connected to a national organization, they are not subject to the same laws as Teamsters, AFL-CIO and other unions. There are numerous laws enacted to ensure union members are protected against organizational corruption. Unfortunately, these rules do not apply to corporations. I did not feel it was appropriate that the president of MEA could use union credit cards for dog washes, hair styling, groceries, or cash withdrawals at casinos. I also did not feel that the MEA should have allowed the Republican led City to underfund the Pension system in order to fund the Republican Convention. As for your allegation that the split was a result of “Political Forces”, it was Donna Fry, Ben Hueso, Todd Gloria and Marti Emerald who voted to allow each individual permanent lifeguard the right to choose their representation. It was Republican Mayor Sanders and Kevin Faulconer who chose to ignore the corruption and tried desperately to keep us in MEA. Lifeguards overwhelmingly chose Teamsters. This year the Lifeguard budget increased by $2.4-million (15% over 2012). They are some of the highest paid Lifeguards on the planet. This is a confusing statement. You seem to infer that we are making 15% more than last year. We agreed to a 6% cut in ’09. The cut is still in place and there have been no financial increases to our members. In addition to the cuts, we agreed to extend retirement to 55, eviscerate retiree health benefits and pay more into our pension. The 2.4 million you refer to is the restoration of four positions, a Fire/Rescue vessel, and two surf rescue vessels. We also replaced 80% of our PWC’s and ATV’s. One note of interest is that the lifeguards were the only group to bring money into the City. The deal with Toyota saved the City approximately 1 million dollars. We also sold the old fleet of trucks for $257,000. Due to the Toyota deal, we were able to get new trucks and fund needed training/equipment. That is where the bulk of the increase came from. They are some of the highest paid Lifeguards on the planet. The name “Lifeguard” is used throughout the world. It is applied to 14 year old kids watching a small pond in the Midwest, and it is used for watermen and woman making rescues in thirty foot surf. San Diego Lifeguards have a wide range of duties that are not normally performed by traditional Lifeguards. LA County Lifeguards make approximately 25% more than SD Lifeguards. They are the only agency I know of that performs similar duties. SD Lifeguards are the lowest paid of the three San Diego safety services. As you know, San Diego Lifeguards have the highest injury rate and rarely make it to retirement. We work an average of 7 seasons training and learning to be full time guards. During this time, we are not in the retirement system and there are no benefits. This is why I would like to change our name to the Marine Safety Department. Comparing our salary to “Lifeguards” from most agencies is not comparing apples to apples. Please click this link to see Brian Zeller testifying before PSNS. Go to February 13 PSNS (public safety neighborhood service) It is around 13 minutes into Public comment. I do not believe we are overpaid. As a former lifeguard, it is my firm belief that every child that grows up in San Diego has a right to be safe in the ocean, to learn to swim, and to understand and enjoy the unparalleled environments along our coast. These resources are our shared heritage, and should not be limited to the elite, wealthy community, that can afford to live along the shore. Access to the beach is a fundamental right that you and I seem to agree on. In San Diego, drowning is the leading cause of death in children under age 4. I created “Fill the Fin” in 2011. Working with Councilmembers Tony Young and Sheri Lightner, we partnered with the Padres to raise money for Jackie Robinson YMCA. 100 % of the money was used for aquatic programs in the poorest of neighborhoods. Lifeguards do not fall into the “wealthy elite.” Very few can afford to buy a home, most that do buy in Clairemont. I grew up inland of Disneyland. It took an hour to get to the beach on the City bus. That is how I got to the beach. Further, since the budget cuts took effect in 2009, City Lifeguards have cut all “Outreach Services” from programs such as operation “Waterproof San Diego” to protect their employee salaries. The Lifeguards did not cut “Outreach Services” any more than we cut our salary by 6%. The 2009 cuts came from the Mayor’s office. They cut funding to Outreach; they also cut the Jr. Guards, 3 R’s, 95% of training, Blacks Beach, one Captain and fired four guards (the only Safety Service to actually lay off staff). They also confiscated money we responsibly put away to buy vehicles, vessels and equipment. The “Lifeguards” again showed their resilience by forming a non-profit foundation to continue the Jr. Guard and Outreach program. Since their formation, they have provided scholarships to hundreds of underprivileged kids. They have partnered with Jackie Robinson YMCA and are now working with local schools to provide swim programs. They are providing more aquatic support to low income families than the City has ever seen. This is an area that I find mutual agreement. As you read in the Beacon, one of our union goals is to increase our diversity. You use the term “Old Boys Club.” In many ways I completely agree with you and know this to be true. Those who may fit into this category are not active in the union. You must remember that the Lifeguard union does not control hiring or promotion. The best we can do is lobby for a level playing field. A few months ago, we challenged the make up of a promotional board. Due to our inquiries, two out of three board members were replaced. As a result, the most qualified candidates were chosen. We now have our first Hispanic sergeant not because of his race, but because he was truly the best. Diversity challenges have been problematic for many years. To be a lifeguard, you must be more than a fast swimmer. You must be able to feel around in darkness for a submerged body, jump into large surf from boats, piers and rocky points. Lifeguards must be able to operate a wide range of equipment, make cliff rescues, river rescues and enforce the law. On top of all this, you are usually on your own. Our supervisorial staff represents the beach demographic twenty years ago. The best way for us to create diversity in future supervision is to hire more diverse seasonal guards. Very few seasonal guards become permanent Lifeguards. It is and should be a competitive process. Because recruiting is not a department priority, we do not have large numbers of diverse employees trying out for seasonal work. Regardless of race or gender, only one in 50 or 100 seasonal guards might make it to permanent. If you start with only a few females, the odds are that they will not make it to full time. If you start with 50 or 100, we may get one to make it to full time. Remember, we hire and train about 5o seasonal lifeguards each year. We only hire a few permanents every few years. In the Marines everyone was green. Race and gender did not matter as long as you met the standard. The Lifeguards need to recruit, train, test and evaluate Lifeguards in a consistent manner. The goal is to uphold the standards that allow us to safely guard the public. There is no reason we cannot do this with a diverse workforce. We will be addressing these issues with Mayor Filner. I am confident that we will make giant strides in the years to come. Much has changed since you left in 2009. The Teamsters are driving positive change. Supplemental questions not answered above. How much $ does the City of San Diego get from the “Beach Patrol” reality-TV show that films our lifeguards at work and profits from the commercial broadcast? Beach Patrol ended several years ago. The union was not in power during that time. Your question is more relevant to the Lifeguard series airing now on the Weather Channel. Two years ago, the Lifeguard Chief authorized LMNO productions to shoot what was supposed to be a “Pilot.” The union was informed about ten days prior to shooting. Strangely, there was no contract and the City got no pay. We did get an $8,000 Rhino from the company. We were not supportive. The company produced approximately 13 episodes and did not reimburse the City for our time or expenses. Last year we were informed that the City signed an agreement to produce another 13 episodes. The contract was for $25,ooo. We did not support the agreement, but our concerns fell on deaf ears. The City imposed on the Union and the company was again allowed to film. Most full time guards, including myself, opted out of last year’s filming. Our only control was to refuse to participate in after-interviews. Because we are out in public, they have a right to film us. Our concerns are the same as yours; we should not use City dollars to subsidize a production company. People who are being rescued, arrested or treated do not like to be filmed. It is distracting to our employees and disrespectful to the public. We are further concerned about overdramatizing shark sightings and its negative effects on the seal issues in La Jolla. You will see some news articles coming out soon. Is it true that Lifeguard Management was exempted from the 6% pay cut that all other departments and seasonal lifeguards suffered? If so, who was responsible for that decision? I do not know if management was exempted or not. The only management position we have is the Chief. I do not represent him. I do know that the former mayor found several creative ways to reward his staff. Lifeguards in the bargaining unit all took the 6% cut and it is still in place. We have 16 sergeants, not 24. Between 2001 and 2010 the Lifeguards settled no less than 5 Sexual Discrimination cases with former female employees, with an average settlement of $100,000/case. I do not know if this is true. I do know that only two cases went to court. One was cited in your attachments. The City has lawsuits filed by people all the time. Some suits are legitimate and some are not. The City must make a judgment on wether or no it makes sense financially to fight or settle. All cases under brought against the guards were settled. Two cases brought under the current City attorney went to trial. I was very involved in James Murphy vs. the City. He is a white Male and former Marine. I held him to the same standard I hold all my employee’s. We prevailed in that case. Some of the cases you referenced involved Lifeguard who were not in my opinion living up to the standard. It is not ok to show up late and leave swimmers unattended. We cannot allow guards to text or read a book on water observation. Some allegations had merit, many did not. If this is true, why doesn’t the department have an affirmative action policy to correct the imbalance and replace management? The Union does not control “Management”, they serve at the discretion of the Mayor. Being a full time San Diego Lifeguard is a great job and I am fortunate to be one of them. Please let me know if I can provide any other answers for you. Thanks for the article. You may want top check out the Libertarian lifeguards group on facebook. For info on people using voluntary Libertarian tools on similar and other issues worldwide, please see the non-partisan Libertarian International Organization @ http://www.Libertarian-International.org …. Good discussion – I must ask, since I’ve seen the Lifeguard shows I’ve wondered how much revenue it generates. I suspect one opinion is that the publicity is good for San Diegoso the revenue is not important. But the revenue might be good for the infrastrucutre. On the other hand to give it away, to allow the use of active duty lifeguards for a commercial film might be considered a gift of public money which is illegal under State law for which a Rhino valued at $8,000 may be insufficient. There are a number of State Government Codes that requires cost recovery. Somewhere buried in the Lifeguards (Parks & Rec) paper work is an hourly reimbursement rate. It’s probably around $150 an hour fully loaded, but that’s just a guess if not an educated one. The Lifeguards know how much time is involved though Ed Harris mentioned the lifeguards “…were not supportive. ” Now that LMNO is paying they’ll likely expect some entitlement. Chances are LMNO Productions prefer to shoot in the summer – good weather and bikinis – and that would add overtime. Ed, you might look into whether or not LMNO can produce an episode using less than 10 hours of lifeguard time? Overtime was paid for by LMNO for last year. There was not payment for the prior year that I am aware of. The department did not seek payment for hours lifeguards were already working. We are concerned that the numerous hours helping produce the show takes away time that should be used to serve the public. In my recent response to issues raised by Mike Russell, I laid out the reasons Lifeguards chose to leave the Municipal Employees Union (MEA). It is my opinion that the MEA made several organizational changes that have greatly improved the organization. It should be noted that MEA conducted an independent internal investigation, which led to the dismissal of Judy Italiano. Since that time MEA has been led by Mike Zucchet. Anne Smith has been and continues to be the MEA’s Legal council. All San Diego employees have benefited by the leadership Mike and Anne have provided over the last four years. In my effort to answer the questions raised I put forward past history. I failed to clarify past and present. personally, i just want to be saved by the most qualified lifeguard…..it’s just wrong that that this discussion has to be going on……. Thanks to the OB Rag for picking up and reposting the discussion occurring on our Point Loma Democratic Club website, regarding lifeguard issues. We are working to serve as a platform for politically focused, civil, illuminating interactions for which there is great need. We want to take this opportunity to invite the community to our next meeting. Local OB/Point Loma residents Pam Page and Dianne Lane, of Women Occupy San Diego Money Out of Politics, will discuss the tortuous path they took, to the successful conclusion of a unanimous vote by the San Diego City Council, supporting WOSD MOP’s resolution to reverse ‘Citizens United’ and Amend the Constitution. Our club was their very first endorsement so we are excited to have them return. Excellent and honest article. Thanks for your concern.